We had a chat with the creator of the Horrible Histories series Terry Deary. 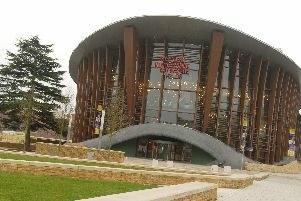 It is ahead of the stage show coming to the Waterside Theatre in Aylesbury. The Groovy Greeks and Incredible Invaders can be seen from Tuesday June 28 to Saturday July 2. Terry talks about the franchise, it’s popularity and what he is working on at the moment. Q: When you wrote your first Horrible Histories did you ever imagine the idea would go on to be so successful? A: Yes, I think most authors believe their work will be a huge success even though most books disappear from print after a couple of months. It’s that hope that keeps us going. When I wrote my very first fiction book 38 years ago my publisher said, ‘writing is like a sausage machine and you have to keep stuffing in at one end so something comes out the other end – it is like a process’. I kept writing book after book – fifty fiction titles before HH came along - but I never imagined I would have a series which would become first of all iconic and secondly that would still be selling 20 years later Roald Dahl has managed that, but I can’t think of anyone else who is still selling so well. What usually happens is that people have sensational ideas and they sell really wellfor a while but they do tend to come and go. It is a shame you can’t predict which are the ones that will last! Q: What do you believe is behind the popularity of Horrible Histories? A: Nobody had done anything like them before and they filled a desperate need. There were fact books for children but they tended to be written by experts on the subject. They knew their history but they didn’t have a clue how to write about it for children. So with Horrible Histories, instead of an expert who couldn’t write, they approached a children’s author who knew nothing about history. I get all my facts from research. I do my research and say ‘you will never guess what I discovered’ and ‘phwoar, this is great’. It is actually a simple answer. I say I am not an expert in history and this is why they work. Down the years people have tried to copy Horrible Histories by doing funny fact books but they never get it right because they use experts not writers. Q: Have you ever found any facts which were too horrible to include? A: Well the publishers have said so. For example when the Vikings invaded they became settlers and had families here. But these settlers were as vicious as the Vikings and when they invaded a Viking village they would find a Viking child, swing it by its legs and bash its brains out. But when I told the publishers they said ‘we can’t have that’ which is strange as I can’t see it is any worse than some of the other parts which have been included. On the other hand there are facts which some people feel you can’t talk about, say in World War Two. For example when we came to the television series, we were sitting round the table and we talked all about the bombings and the Blackout and got that sorted. Then we got to the Holocaust and there were six or seven pages and they read them in silence and then said ‘of course we can’t do that’. I am actually quite proud of the fact that television can’t do the Holocaust but I can. Q: Why do Horrible Histories work so well on stage? A: We work really well as a team. BSC actor/director Neal Foster is very knowledgeable and experienced in children’s theatre. BSC has been going over 20 years now. I have been a professional actor for 40 years. So, between us, we know what we are doing. We are not trying to write literary stuff. It isn’t the books on stage, we are not determined to be true to the spirit of the books, we are writing for theatre. So it is fresh and original. Q: So what next for Terry Deary? A: I am working on some adult history books in a new series called “Dangerous Days”. The first was published in November 2013 and was entitled “Dangerous Days in the Roman Empire”. That will be followed in 2014 and 2015 by books on Victorian Railways, Elizabeth I and Ancient Egypt... They will have a layer of humour and will be a bit gruesome. They are more or less Horrible Histories for adults but we can never ever use that title. There will also be new Horrible Histories titles while I’m planning movies and television series based on my adult books and my fiction. Q: After all this research are you now an accidental history expert? A: Definitely not. I know very little about history because I can’t keep it all in my brain. I have only got about three brain cells. I often forget what I have written because I can’t hold all those facts. I pick up a Horrible Histories book, maybe to revise it, and I read something and think ‘I never knew that!’ But I can be an anorak with facts. I was watching Horrible Histories on television and up came the Vile Victorians and along came Burke and Hare, the body snatchers. And I was jumping up and down and shouting at the television ‘no, they were 1827 – 12 years before Victoria came to the throne. They weren’t Vile Victorians!’ Now that is anorak.